UPDATED – VATICAN CITY (CNS) — For more than 38 years, Capuchin Father Raniero Cantalamessa has preached to the pope and top officials of the Roman Curia. In early January, he will lead the weeklong retreat of the U.S. bishops. “The Holy Father asked for my availability to lead a series of spiritual exercises for the episcopal conference so that the bishops, far from their daily commitments, in a climate of prayer and silence and in a personal encounter with the Lord, can receive the strength and light of the Holy Spirit to find the right solutions for the problems that afflict the U.S. church today,” Father Cantalamessa wrote. The job of “preacher of the papal household” is not a fulltime position; each year it requires the priest to give an average of eight meditations — one each on most Fridays of Advent and Lent — and the homily during the pope’s Good Friday celebration of the Lord’s Passion. When he is not preaching to the pope, Father Cantalamessa leads retreats around the world, writes books and articles and works with charismatic Catholics; in late October, he was named ecclesial adviser of “Charis,” the new international coordinating body for the Catholic charismatic renewal. 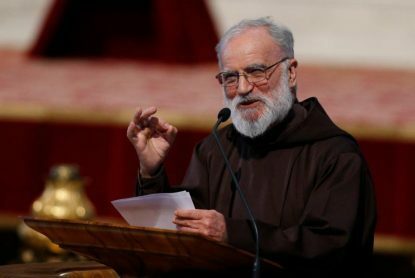 While focused on challenging and strengthening the faith of those he is preaching to, Father Cantalamessa’s homilies have touched on religious persecution, Christian unity, signs of hatred and prejudice in society, violence against women, war and peace, the defense of human life and the abuse crisis. His homily in St. Peter’s Basilica on Good Friday in 2010 caused controversy. At the service, presided over by Pope Benedict XVI, the Capuchin focused on how Jesus broke the cycle of violence and victimizing others by taking on the world’s sins and offering himself as a victim. He had noted that in 2010 the Christian Holy Week and the Jewish Passover coincided, and he told the congregation the Jews “know from experience what it means to be victims of collective violence,” and they recognize when other groups are being attacked simply because of who they are. He then read a portion of a letter he said he received from a Jewish friend, who wrote that he was following “with disgust” attacks against the church and the pope, including because of the abuse scandal. The repetition of stereotypes and using the wrongdoings of some individuals as an excuse to paint a whole group with collective guilt reminded the Jewish author of “the most shameful aspects of anti-Semitism,” the letter said. However, he had said, acknowledging weakness is not enough to “launch a renewal of priestly ministry.” For that, he said, the prayers of priests themselves and all the faithful are needed as is a renewed commitment by all priests to devoting themselves totally to serving God and their brothers and sisters. And, in Advent 2006, leading a meditation on the passage from the beatitudes that says, “Blessed are they who mourn, for they will be comforted,” Father Cantalamessa said the church’s tears of shame for the abuse crisis must be turned into tears of repentance.